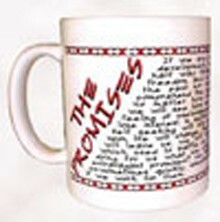 If You Are Painstaking About Your Coffee Mug, The Promises Mug is Suggested... Your Whole Attitude And Outlook Will Change When You Own This 11oz. White Mug Sporting Red Accented Lettering.